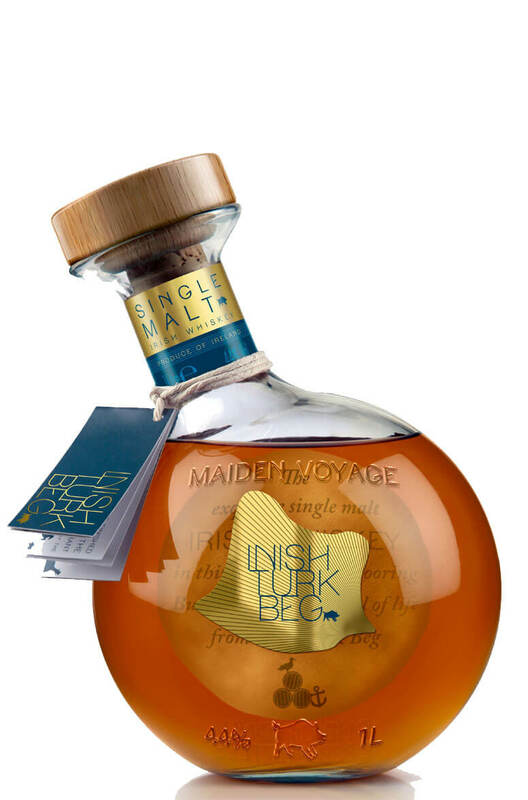 The Inish Turk Beg single malt takes its name from the island of the same name which means 'small island of the boar'. It is one of the many islands in Clew Bay on the Mayo coast. This whiskey is unique in that a final maturation was done in poitin barrels on the island itself. There were just 2888 bottles made of this 'Maiden Voyage' edition and to reflect the sea voyage of the barrels each hand blown bottle resembles a mooring buoy. "Situated off the wild, Atlantic, west coast of Ireland in County Mayo, the island of Inish Turk Beg is a place of outstanding natural beauty, constantly changing vistas and rugged land and seascapes. It’s a place of natural invigoration and inspiration where we enjoy ‘Life Vividly Lived’. Inish Turk Beg launches the first whiskey to be available outside its own shores: a release of just 2,888 “Maiden Voyage” one-litre bottles. A warm, complex and easy-drinking, 44% alcohol, aged Single Malt Irish whiskey, it’s finished in Poitin barrels that have lain on the island drinking in its unique atmosphere and climate. Each Mooring Buoy bottle is a hand-blown piece of art, partly made with sand from the island’s own beaches. And in reducing it from cask to bottle strength, rainwater collected on the island itself, after thousands of miles of being scrubbed clean across the Atlantic, is used. Live Life at a Tilt, with Inish Turk Beg’s Maiden Voyage. Nose Delicate and fresh on the nose with aromas of orange sherbet, freshly sliced apples, pink grapefruit and fruit salad sweets. Palate Fresh and fruity. Medium to full bodied with a nice mouth-feel. Flavours of orange peel, ripe apples, lemon curd, ginger snaps and tropical fruits. Finish Dry and long lasting with vanilla and a touch of spiced apples coming through at the end. Types of Barrel used for Aging Ex-Bourbon with some finishing in barrels previously used for poitin.